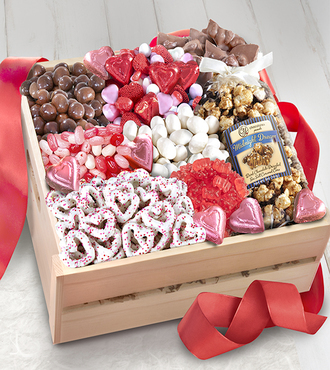 Our Sweet Them Off Their Feet Valentine's Gourmet Basket will make this Valentine's Day full of gourmet goodness for whoever you're sending it to! Arriving in a natural seagrass basket treats, this gift includes caramel hearts, chocolate covered dried Bing cherries, Jelly Belly Valentine deluxe mix candy assortment, Ghirardelli caramel chocolate squares, Ghirardelli dark chocolate squares with raspberry filling, chocolate almond bark, and dark chocolate drizzled caramel corn. Tied with a heart print ribbon, this gourmet gift basket will make a sweet impression and bring love, romance and affection to its recipient.